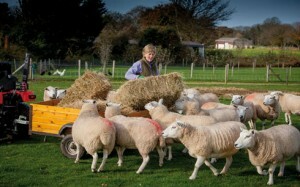 Jenni Riggall has a passion for sheep farming. She prides herself on a high standard of animal welfare, which is reflected in the quality of the delicious, lean, tender lamb from her farm. 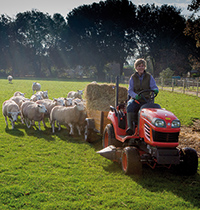 Jenni has been kind enough to spare some time to tell us more about her work and her journey from being a radiographer to a farmer. My name is Jenni and I have been calling myself a radiographer for the last 35 years but a couple of weeks ago I retired from the hospital altogether. For the last 5 years I have been working almost 18 hours a day to extend the farm and together with my own marriage this summer I felt something had to give! I grew up on a farm in Lincolnshire and although it was a mixed farm I was far more interested in the livestock than the potatoes! Although I arrived in Jersey 30 years ago it took me a long time to find a little patch of land to start my first smallholding. A very kind lady let me use her wildness of a paddock which I soon licked into shape and started with a couple of sheep and chickens. After a few years I wanted to expand and fulfil my dreams of being a full time farmer. It took me a few more years to find a large enough piece of land to make it viable. I recognised that there was a market for top quality niche products that had been locally grown and where the consumer could see that animal welfare was of paramount importance. I also wanted to turn the clock back 300 years to when Jersey was covered in orchards and sheep, that clearly wouldn't work today all over the Island but in the heart of St.Lawrence it does! Every day is different throughout the year. At the moment I need to feed all the livestock and orphan lambs and there are other tasks like vaccinations etc. Animal houses need to be cleaned out, courses need to be sorted, emails answered, eggs sorted, the orchard and vegetable plot maintained. There is also a lot of paper work. 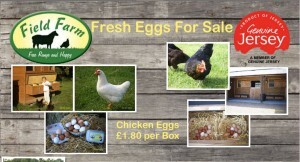 Presently I run 3 different courses: Sheep, Smallholding & Chicken. They are half day rural sessions educating people in the basics of everything they might need to know regarding animal rearing and welfare. I also assist veterinary students wanting work experience during lambing. I hope to extend the courses to sausage making and smoking one day.